I've drawn and painted all my life and I've been painting professionally for the past 15 years. I was born in London and moved to Newquay, Cornwall when I was a child. I studied painting at Falmouth College of Art and printing before that, receiving B.A. Honours in both. I recently moved to Brittany, France with my Scottish husband and daughter where we are redeveloping an 18th C. farm. 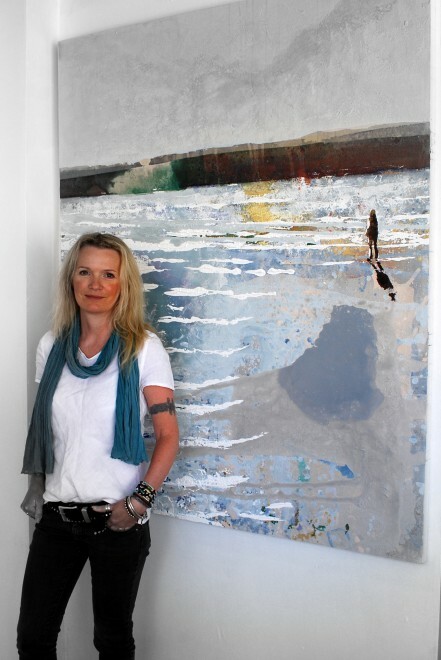 My paintings are influenced by the Atlantic shores of Cornwall, France and Scotland. Daily routine I get up around seven and drink tea and check out the Internet until our daughter has gone to school. Then I walk the dogs on the beach - the morning walk is a ritual, it gets my head in the right place to start the day. I try to focus on looking at nature, mainly the light and the water. Back at the farmhouse, it's the usual things involving strong coffee, answering emails and planning the day - I'm in the studio around 10. I wear paint splattered jeans, trainers, various layers and a woolly hat in winter. I work on the floor or stand up at an easel until 6-ish. In the evenings I mess around on the internet looking at paintings, reading reviews and blogs. It's 24/7 really. Childhood ambition Ever since I can remember, I've wanted to be an artist. At my school in Cornwall, we were very lucky because we had 4 art teachers. A group of us competed for the best marks and most of us went to Falmouth College of Art. My studio I keep moving studios, my last one was in an old hotel where it's rumoured that the artist Paul Gauguin stayed and painted a landscape in the loft. Hence the title of my blog, Gauguin's Loft! At the moment, my studio is in the kitchen of the old farmhouse which has 1779 carved over the door. It has an original belfast sink in the corner and one cold tap. It faces south so the light is good. I can make as much mess as I like because the house is going to be gutted. This is studio number eleven. Favourite artists I'm very fond of Cornish artists and artists based in Cornwall, both contemporary and historical. Practicing artists I admire include Kurt Jackson, Judy Buxton, Lisa Wright, Naomi Frears and many others. St.Ives has attracted artists since the 19th C. - in fact it was effectively established from Brittany and my nearby towns of Concarneau and Pont-Aven. My favourite 20th C. artists from St.Ives include Ben Nicholson, Barbara Hepworth, Patrick Heron, Peter Lanyon and Sir Terry Frost. My favourite gallery is the great sculptress Barbara Hepworth's Trewyn Studio and garden in St.Ives. On my wall I tend to swap paintings around, at the moment I have a painting I made of my daughter when she was a baby, and paintings by Paul Wadsworth and Glyn Macey, both artists in Cornwall. Treasured possessions My blog is a treasure because it is my notebook and photograph album. It's a place I go to to create with words and to reflect. I would also be lost without my sketch books, which are a constant reference point for my paintings. Favourite restaurant I love the new luxury eco 'Scarlet Hotel' in Cornwall. It has amazing views of my favourite surfing beaches in north Cornwall, fabulous food and a great vibe. Most played album I play music all the time when I'm in my studio, it's very important to me. In the morning I play albums by Cohen, Cash, Dylan, Antony and the Johnsons, Rufus Wainwright, Radiohead. I liven things up in the afternoon with Faithless, Bjork or P.J. Harvey. Bedside reading There's always a pile of books to read by my bed .... mainly classics and contemporary distinguished writers. I have a special pencil with which to note interesting passages, many of which I post on my blog.